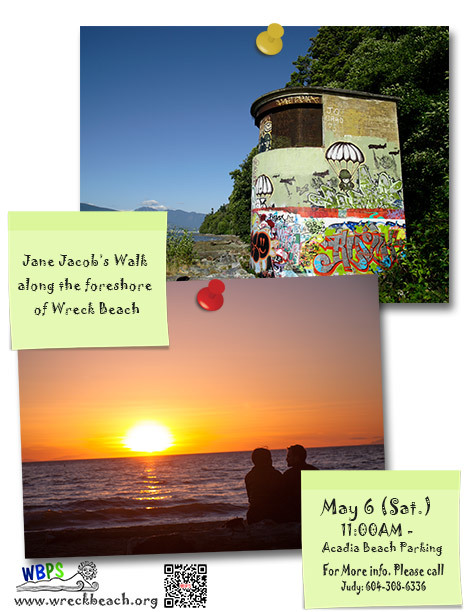 Jane Jacobs Walk along the foreshore of Wreck Beach Tomorrow@11AM | Welcome to Wreck Beach! We are going to meet @ Acadia Beach Parking Lot. Hike goes from parking lot to Trail 3, up Trail 3 and down NW Marine Drive. You might want to bring a lunch because it will take between 3-4 hours. This time of the year, the weather could be unstable. So, we will recommend to bring jacket and decent walking shoes.